Early diagnosis and prompt treatment are paramount for improving survival. If present, early identification and withdrawal of an offending agent is vital. In a 10-year observational study of 113 patients with SJS or TEN, early withdrawal of the causative drug reduced the risk of death by 30 percent for each day prior to the development of blisters and erosions. Patients suspected to have SJS/TEN can be evaluated using the Severity of Illness Score for TEN (SCORTEN). Those presenting with a more severe course, comorbidities, and a SCORTEN score of >1 should immediately be admitted to an ICU or burn unit. In a retrospective multi-center review of 199 patients with TEN treated promptly at burn centers, the overall mortality was 32% compared to 51% among patients transferred to a burn center more than one week after disease onset. Disease severity is the main risk factor for mortality within 90 days of disease onset. [11,12] In severe cases with extensive skin detachment, acute complications may include massive loss of fluids, electrolyte imbalance, hypovolemic shock with renal failure, bacteremia, insulin resistance, development of a hypercatabolic state, and multiple organ dysfunction syndrome. Sepsis is the most common cause of death. With the use of prescription medication on the rise, and more than 200 medications reported to be associated with a possible SJS/TEN reaction, it is essential for emergency physicians to recognize subtle and early presentations of SJS/TEN in order to maximize patient outcomes. 1. Kohanim S, Palioura S, Saeed HN, et al. Stevens-Johnson Syndrome/Toxic Epidermal Necrolysis – A Comprehensive Review and Guide to Therapy. I. Systemic Disease. Ocul Surf. 2016;14(1):2-19. 2. Long B, Long D, Koyfman A. Tiny Bubbles: Vesiculobullous Rashes. Critical Decisions In Emergency Medicine. 2016;30(7):3-10. 3. French LE, Prins C. Erythema Multiforme, Stevens–Johnson syndrome and Toxic Epidermal Necrolysis. In: Bolognia JL, ed. Dermatology. 3rd ed. 2012:323-333. 4. Kantor ED, Rehm CD, Haas JS, Chan AT, Giovannucci EL. Trends in Prescription Drug Use Among Adults in the United States From 1999-2012. JAMA. 2015;314(17):1818-31. 5. Roujeau JC, Chosidow O, Saiag P, Guillaume JC. 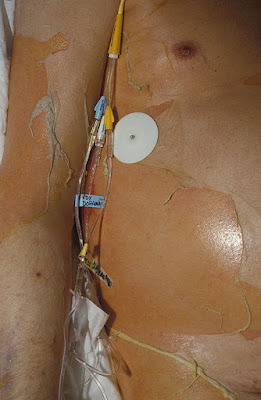 Toxic epidermal necrolysis (Lyell syndrome). J Am Acad Dermatol. 1990;23(6 Pt 1):1039. 6. Schwartz RA, McDonough PH, Lee BW. Toxic epidermal necrolysis: Part II. Prognosis, sequelae, diagnosis, differential diagnosis, prevention, and treatment. J Am Acad Dermatol. 2013;69(2):187.e1-187.e16. 7. Mockenhaupt M. The current understanding of Stevens-Johnson syndrome and toxic epidermal necrolysis. Expert Rev Clin Immunol. 2011;7(6):803-13. 8. Kohanim, Sahar et al. Stevens-Johnson Syndrome/Toxic Epidermal Necrolysis – A Comprehensive Review And Guide To Therapy. II. Ophthalmic Disease. Ocul Surf. 2016;14(2):168-188. 9. Garcia-Doval I, LeCleach L, Bocquet H, Otero XL, Roujeau JC. Toxic epidermal necrolysis and Stevens-Johnson syndrome: does early withdrawal of causative drugs decrease the risk of death? Arch Dermatol. 2000;136(3):323. 11. Mahar PD, Wasiak J, Hii B, Cleland H, Watters DA, Gin D, Spinks AB. A systematic review of the management and outcome of toxic epidermal necrolysis treated in burns centres. Burns. 2014;40(7):1245. 12. Sekula P, Dunant A, Mockenhaupt M, Naldi L, Bouwes Bavinck JN, Halevy S, Kardaun S, Sidoroff A, Liss Y, Schumacher M, Roujeau JC, RegiSCAR study group. Comprehensive survival analysis of a cohort of patients with Stevens-Johnson syndrome and toxic epidermal necrolysis. J Invest Dermatol. 2013;133(5):1197-204.